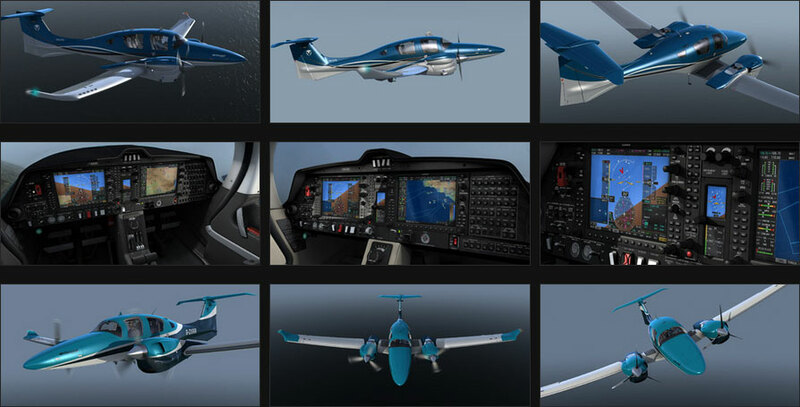 The Diamond DA62 is one of the newest and most advanced GA aircraft you can buy today. Powered by two turbo-charged 180hp jet-fuel diesel engines, the DA62 features a sleek carbon-composite airframe, advanced avionics, TKS anti-icing, redundant engine control computers, and many more advanced systems. The Vertx DA62 provides the most realistic and immersive flying experience possible. Every aspect of the Vertx DA62 exhibits unmatched attention-to-detail—from the 3D models and textures, to the avionics, the aircraft systems, the aerodynamics, the sounds, and the overall user experience. The Vertx G1000 features the clearest and smoothest-moving glass display yet seen in P3D, thanks to the innovative use of 3D modelling to build the digital display. Text is clear and readable, colours are smooth and crisp, and the attitude indicator moves perfectly smoothly at the same frame-rate as the rest of the sim. Large, clear maps with multiple display options. A fully featured flight planner that allows you to create, save, edit and load flight plans directly in the G1000, or load flight plans from an external flight planner. Realistic direct-to, GPS OBS, VNAV and GPS LPV approach guidance. The DA62 is powered by two 180hp, liquid-cooled turbo-diesels. Each engine features dual control computers with automated run-up, single power lever control and automatic propeller feathering. The Vertx DA62 faithfully recreates all of these advanced engine systems, making for a unique flying experience. A custom electrical system with realistic battery drain, ground power, backup batteries on engine ECUs and the standby attitude module. A realistic fuel system with manually pumped auxiliary tanks. Emergency gravity powered gear extension. TKS anti-icing. Supplemental oxygen. And much more. Fly too high for too long and your virtual pilot will start to feel the effects of oxygen starvation. His vision will fade, you’ll hear rapid breathing and aircraft control will become uncoordinated. If left unchecked you’ll eventually lose complete control of the aircraft. Thankfully the DA62 includes supplemental oxygen to keep hypoxia in check. Every time you load the Vertx DA62 it will be exactly the way you left it. Every single switch and control in the DA62 cockpit is saved between flights. Fuel, oxygen, de-ice fluid levels, and payload are also saved. Alternatively you can select ‘cold and dark’ or ‘ready for take-off’ via the DA62 config app. Using code written outside of the standard P3D flight model, the lift and drag values for each individual wing are constantly calculated, ensuring the most realistic low speed, stall, and spin characteristics possible. To ensure the most realistic single-engine handling possible, we’ve added more custom code to simulate single-engine asymmetrical thrust. An engine failure while flying at high power with low airspeed can lead to loss of directional control and inadvertent spin entry. All interior sounds are controlled by custom code exclusive to the Vertx DA62. The engine sounds feature ultra-realistic response to RPM and power changes. Propeller sounds feature numerous advancements including propeller blade angle-of-attack effects. Wind sounds react to aircraft attitude, gear position, and more. Sounds become louder when you open the doors. The exterior and interior feature beautifully rendered lighting that is visible during the day and night. The panel features dimmable flood-lighting, as well as separately dimmable label back-lighting. All interior and exterior lights, as well as the custom landing and taxi lights, are designed to have no impact on framerates. Wing flex with custom control code. Doors that react to airspeed and attitude changes. Volumetric propellers that smoothly transition between high and low RPM. Floating magnetic compass. Cockpit vibrations. Stall buffet. Over-speed cockpit vibrations and wing flutter. Engine start-up and shut-down vibrations. And much more. You can set the Vertx DA62 to be just the way you like it using the included config app. Sounds, animations, avionics settings, aircraft load settings, fuel, payload, and more can all be tweaked. You can make changes using the config app while you are flying, and the changes will appear in the sim without the need to restart P3D or reload the DA62. Rather than applying a finished 2D gauge to the virtual cockpit panel as is the case with other glass gauges in P3D, the Vertx G1000 displays are built up from multiple, separately modelled 3D parts. This provides a number of advantages—the animated parts are rendered by the GPU, and each item on screen can be optimised to provide maximum graphics quality without noise or colour-banding, clear and readable text, and ultra-smooth animation that runs at the maximum possible refresh rate (2D gauges in P3D are limited to an 18fps refresh rate). All settings are saved between flights. This includes flight plans, displayed windows, nav/com frequencies, AFCS settings, trip statistics and more. G1000 code has been extensively optimised to provide excellent framerates. Perfectly recreated 3D bezels, buttons and knobs with dimmable back-lighting. All buttons and knobs are animated. Large, easily located click-spots that change colour when you hover your mouse cursor over them. Mouse-wheel support on all rotating knobs. Sounds include custom alert and annunciation tones, subtle button and knob input sounds, and numerous voice alerts. Choose between male or female voice alerts via the G1000 System page. Realistic dust and reflections are visible on the G1000 screens. You can choose to hide either or both via the included config app. Start-up and shut-down routines are just like the real G1000. Startup takes a little over a minute but you can choose a much faster start-up via the config app. Fully featured Crew Alerting System (CAS), providing warning, caution, and alert annunciations. A separate window on the PFD displays more detailed annunciation messages. The MFD and PFD maps include multiple display options. Choose between north-up, track up, DTK Up and HDG Up. Waypoint auto-zoom, which always keeps your current flight plan waypoint in view, can be set on or off. Many more map display options are available. The terrain map overlay can be displayed over the topographic map or the regular black, non-topo map. Numerous Auxiliary pages are included. The Trip Planning page shows a plethora of useful information such as flight plan ETA, fuel usage and fuel required, density altitude, current leg map, and much more. The Utility page includes multiple timers, schedulers, and usage statistics. You can set custom messages in the timers and when the timer expires, the message is displayed on the PFD CAS. The usage statistics allow you to keep a track of miles covered, hours flown, average speed and more. The Utility page includes multiple timers and schedulers. You can set custom messages in the timers, and when the timer expires, your message is displayed on the PFD Crew Alerting System. A number of trip and usage statistics are logged and saved between flights. This includes an odometer, or total distance covered, landing count, average ground-speed, maximum ground-speed, flight time and more. You can create flight plans from scratch, and edit existing flight plans directly in the G1000. You can save and load flight plans directly in the G1000. You can load externally created flight plans into the G1000. You can use the built-in P3D Flight Planner or a third-party add-on flight planner. You can set a direct-to while a flight plan is loaded, and resume the flight plan once the direct-to is cancelled. Direct-to waypoints can be part of the flight plan or a separate waypoint. You can also set a custom direct-to bearing (rather than a direct path to the selected waypoint). This feature allows you to set a custom bearing to the active GPS waypoint, using the G1000 course knob. Upon reaching the active waypoint when in OBS mode, normal flight plan operation resumes. In addition to mouse input, you can use your keyboard to enter airport and navaid searches, waypoints, flight plan titles, and scheduler messages. Flight plans created in the P3D flight planner will include airways in the active flight plan display. Realistic vertical navigation is available on flight plan enroute and initial approach phases. VNAV altitudes are automatically loaded into flight plan approaches. GPS-guided approaches with precision vertical guidance are simulated. GPS LPV approaches include vertical guidance on the final approach phase, much like a traditional ILS. The autopilot can automatically track the LPV glidepath. The Vertx G1000 uses the internal P3D airport and navaid database. The advantage of the internal database is that all installed third party airports and navaids are visible in the G1000. Third party database updates such as FSAerodata and Aero Sors are supported. Almost all of the autopilot functions have been custom coded. This makes it possible to improve on the built-in P3D autopilot, and allows the autopilot to closely match the real G1000 autopilot. Pitch hold mode smoothly and accurately maintains a set pitch attitude. In pitch hold mode you can control pitch angle using your joystick. See Course-Wheel-Steering below. Roll hold mode smoothly and accurately maintains a set bank angle. In roll hold mode you can control bank angle using your joystick. See Course-Wheel-Steering below. FLC mode smoothly and accurately adjusts pitch attitude to maintain your selected airspeed. Sometimes called IAS mode, FLC mode is used to climb or descend at a constant airspeed. VPTH mode is used to track a flight plan’s vertical descent (VNAV) profile, and capture VNAV altitudes. Enroute VNAV profiles are set on the flight plan page. Initial approach VNAV altitudes are automatically loaded when an approach is loaded. This mode tracks the ILS glideslope on an ILS approach. This mode tracks the LPV glidepath on a GPS LPV precision approach. Altitude hold mode smoothly and accurately maintains your selected altitude. Being custom coded, it doesn’t suffer from the high altitude pitch oscillations that are often present in the default P3D autopilot. CWS allows you to control certain autopilot modes via your joystick. Two different types of CWS are available—a simplified ‘auto’ CWS that is triggered whenever you move your joystick, or a more realistic button operated CWS. Auto CWS can be disabled via DA62 config app. 15 degree banked turns are calculated between enroute flight plan legs. The built-in P3D yaw damper only centres the slip/skid indicator without having an effect on the actual aircraft flight path. The Vertx G1000 features a custom yaw damper that dampens yaw movements and accurately coordinates turns. The yaw damper works in conjunction with a custom slip/skid indicator that behaves much more realistically than the built-in P3D turn coordinator. The Vertx DA62 features smooth, harmonised controls, accurate performance figures, and realistic handling qualities, with a number of key advancements over the standard P3D flight model. The goal while developing the Vertx DA62 was to create a flight model that isn’t just accurate as far as the ‘numbers’ are concerned, but to create a flight model that gives the impression of a real aircraft with mass moving through a body of air, and to make sure that it not only behaves properly when you do all of the right things—but that it also behaves properly when you do something wrong and end up in a position you would never want to be in real-life. Touchdown is one of the most satisfying moments for any pilot, so particular attention was given to how the DA62 handles this critical phase of flight. If desired you can keep holding the DA62 off the runway as you continue to slow down and raise the nose, with the wheels inches off the tarmac, and the DA62 will respond beautifully to your controls. Delicate full-stall landings are possible with a bit of practice. After touchdown the nose will gently settle onto the runway during the landing roll. Rudder and yaw response received particular attention. This is a key area when it comes to making a simulated aircraft feel like the real thing. You can side-slip the Vertx DA62 to high yaw angles with crossed-controls, and drag and descent rate will increase as a result. This is a very useful technique for getting into those tight airports, or if you misjudge your height on approach. Side-slip angle and turn coordinator response during turns have been carefully fine-tuned—the DA62 features a completely custom coded slip/skid indicator to replace the somewhat flawed internal P3D slip/skid indicator, as well as a custom-coded autopilot yaw damper to keep turns perfectly coordinated while the autopilot is engaged. The DA62 doesn’t just behave realistically when you do everything right—it will also behave realistically when you do something wrong. One of the great things about a flight simulator is it can show you what happens when things go wrong, things you could never do in real life. The Vertx DA62 features custom, augmented stall/spin coding, as well as custom, augmented single engine asymmetrical thrust coding. These two features work in concert, making for very realistic single engine, low airspeed handling. You can actually enter a spin as the result of a high nose attitude and high asymmetrical thrust with no further control inputs. The Vertx DA62 features custom, augmented stall/spin code that operates outside of the normal P3D flight model, making for ultra-realistic low speed handling. The stall/spin code calculates angle of attack on the outboard section of each individual wing, taking into account inputs such as yaw-rate, roll-rate, turn-rate, aileron deflection, main wing angle-of-attack, prop wash, and more. These inputs make it possible to realistically calculate the different lift and drag being produced by each wing, the resultant pitch, roll and yaw forces, and the increased drag acting on the aircraft as a whole. Individual wing lift and drag calculations are of particular importance when flying close to a stall. A wing stalls when it flies beyond a certain angle-of-attack, after which the air can no longer stay attached to the top surface of the wing, at which point lift reduces drastically and drag increases drastically. When an aircraft stalls, one wing will always stall slightly before the other, resulting in roll and yaw forces. Certain situations can cause one wing to stall much more severely than the other, and this is what leads to a spin condition. When an aircraft enters a spin, one wing is in a deeply-stalled condition producing low lift and high drag, while the other wing continues to produce lift. The Vertx DA62 can be made to enter a spin using the typical spin entry method—stall the aircraft, hold full aft elevator and then hold full rudder and aileron into the desired direction of spin. But it can also spin in other less intentional ways, for example— if you apply a large aileron deflection to try to roll the aircraft during a stall, you can provoke a spin in the direction opposite to your roll command. You can also provoke a spin if you stall while holding crossed controls (in a side slip for example), or if you stall while holding off bank in a steep turn. In certain situations, for example when one engine is at full power and the other shut-down, the Vertx DA62 can be made to enter a spin while holding full aileron and rudder against the direction of the spin. During a spin, power and aileron input will affect the nose angle of the aircraft—more power and/or opposite aileron will flatten the spin and less power/same direction aileron will steepen the spin. Despite how it sounds from all of the above, the Vertx DA62 has relatively safe, friendly stall behaviour, just like the real DA62. You need to do a lot of things wrong and ignore a lot of warning signs to get to a point where a spin will occur. Light piston twins should in theory be safer than their single engine counterparts. But the reality is that in general, light twins have a safety record that is not as good as similar single engine aircraft. This is largely due to the difficulty of controlling a light twin when one engine fails. When an engine fails in a twin, the operating engine produces a strong yaw and roll towards the dead engine. The effects of this yawing moment get stronger as power increases and airspeed decreases until it gets to a point where there is not enough rudder or aileron authority to overcome this yawing moment. This point is defined as the aircraft’s minimum single engine control speed, or VMCA, and is determined by flight testing during the aircraft’s certification process. The default P3D flight model has some considerable limitations when it comes to simulating single engine handling in twin-engine aircraft, so the Vertx DA62 features custom code that acts outside of the normal P3D flight model to improve yaw and roll response when one engine is producing more thrust than the other engine. The main goal was to produce realistic loss of directional control when the aircraft is flying at maximum power, with one engine shut down, and with airspeed at or below VMCA. This is the worst-case scenario for an engine failure. A twin engine pilot needs to develop an automatic response to safely deal with an engine loss at or below VMCA. When flying the Vertx DA62 in the above configuration, if you allow airspeed to drop below VMCA (marked by a red line on the airspeed indicator), the aircraft will begin to yaw and roll towards the dead engine, even with full rudder held against the direction of yaw. If you do get into this position it is necessary to reduce power to the operating engine and increase airspeed/reduce angle-of-attack to regain control of the aircraft. If you ignore all these warnings and continue to allow airspeed to decay, the DA62 can enter a spin towards the dead engine even with full rudder and aileron held against the direction of the spin. Propeller drag has also been simulated. If an engine is switched off but the propeller is windmilling, the windmilling prop will produce more drag, and therefore a stronger yaw towards the dead engine than it would if the prop was feathered. With one engine switched off and feathered, and the other engine idling, the aircraft will yaw towards the idling engine, provided you’re going fast enough for the idling prop to generate noticeable drag. The DA62 features two Austro AE-330 liquid cooled turbo-diesel engines running on Jet A-1, with each engine connected to a constant-speed propeller via a 1:1.69 reduction gearbox. Each engine features two control computers with one being active and one being in standby in case of failure. Handling the DA62 engines is unique compared to your typical air-cooled avgas Lycoming or Continental. There is only one power lever per engine—mixture and propeller RPM are handled by the engine computers (ECUs). Before starting each engine you need to wait briefly for the glow-plug to heat up. When it comes to performing an engine run-up test, rather than the manual run-up familiar to most pilots, the DA62 features an automated run-up that checks the engines, ECUs and propeller governors. All the pilot needs to do is hold down a button and the engines will automatically go through their pre-programmed run-up routines. All of the above engine systems are modelled in the Vertx DA62. Even the total time for each engine ECU is logged, and the ECU with the least time is selected before each engine start. When you manually switch between ECUs the engine will shudder slightly just as it does in the real DA62. The DA62’s unique in-flight engine starts and shut-downs have been faithfully recreated. To shut-down an engine, all you need to do is switch off the engine’s master switch, after which the propeller will automatically feather. You can un-feather the prop by switching the master switch back on. When it comes to restarting an engine, you can do so via the starter motor or via a windmill start—the type of start required depends on airspeed. The airspeeds and procedures required are true to the real-life DA62 engine restart checklists. Propeller gearbox temperatures are simulated—whenever the engines are operating at high power and low airspeed, you need to keep an eye on gearbox temperatures, particularly when the outside air temperature is high. The DA62’s automatically controlled propeller RPM has also been faithfully recreated. Governed RPM is based on power lever position. Even the unusual RPM increase when you reduce power below 20% while flying at high airspeeds has been recreated.